Today I decided to "treat" myself by making a card that's all about me!! :) Lilies are my favorite flower and pink my favorite color ... so it makes sense that Stargazer Lilies are my ultimate favorite flower! I sponged the flowers with soft pink first and then, using a small eye makeup sponge, added Rose Red to the centers of each petal. I used my Stampin' Write marker to add the "dots" on the petals to finish them off. I'm pretty happy with how it turned out. They definitely took a bit of time, but they are beautiful! I left the rest of the card fairly plain so that nothing competed with the lilies. I did make a sentiment to go on the front, but I thought it was too much, so left it off. Hope you like. Working with the Whisper White cardstock, I stamped one piece with three lilies with Versamark ink and embossed in white. I colored in the stamens with Really Rust and the stems of the stamens with Certainly Celery although I don't think you can tell I used those colors after the pink was sponged onto the flower so you could just color them in with the Rose Red Stampin' marker to save time. I sponged the lilies with Pretty in Pink ink and then using a small eye make-up sponge, added Rose Red to the centers of each petal. I used the Rose Red Stampin' Write marker (thick end) to add dots to each petal. I then cut the flowers out and set aside. With the second piece of Whisper White, I sponged Kiwi Kiss covering most of the paper and then sponged a little Old Olive on top to give some depth. I cut out four Little Leaves die-cuts and also cut out five thin stems. I glued a stem onto the back of each lily and then added a leaf sprig to each stem. I used the extra leaves to glue on to the remaining two stems to use at the back of my bouquet. The third piece of Whisper White was run through my Big Shot with the Square Lattice embossing folder. I then cropped the paper to 5 1/4" x 4". I used sticky strips to attach the embossed paper to the card base of Pretty in Pink. I then arranged the flowers until I was happy with the placement and tied a ribbon about the bottom to hold everything together. 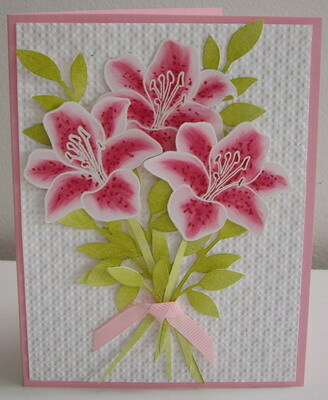 I used a glue dot to attach the back flower to the embossed background. I used dimensionals to attach the other two lilies to the background paper, popping them up and giving them depth. I used two glue dots to hold the ends of the ribbon in place. Labels: all occasion, dry embossing, sizzix, Stampin' Up! This is just beautiful! Lovely! Lovely. Your flowers are so realistic.